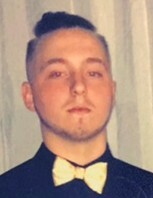 Gabriel "Gabe" (Bain) Turner, 18 passed away Sunday, March 10, 2019. Funeral service will be held at 2;00pm Saturday, March 23, 2019 at Butler Funeral Home Chapel, officiating will be Pastor Johnny Paul and Pastor Shane Paul. The family will receive friends from 12:00pm to 2:00pm Saturday at the funeral home prior to the service. Gabe was born in Cumberland County on April 22, 2000 to Chrystal Myers and Johnny Bain. He also lived in Sampson County for a period of time. He graduated from Wadley High School in 2018 and was attending Southern Union State Community College in Roanoke, where he had just changed his major to Business. He is preceded in death by grandmother, Donna Bain and uncle, Randy Bain, Jr. He is survived by his mother and step-father, Chrystal Myers & husband, Bryan; dad, Johnny Bain; brothers, Daniel "DJ" Hall,Jr., Devon Scott Hall & Caleb Johnson; grandparents, Randy Bain, Sr., Maurice Shatley & Dee Shatley; uncles, David Bain, Mike Shatley & wife, Kayla, Shane Paul & wife, Jenny, Johnny and Jason Paul; aunt, Charlene Callahan & husband, Richard;aunt/sisters, Tiffany Gaspard & husband, Mikey and Faith Ann Turner; great grandmother, Libby Rogers; numerous nieces, nephews, cousins, other family and friends.